From her inception, Bilitis has been one to seduce men. Claude Debussy scored two sets of musical odes to her, painters painted for her, and a great number of Parisian and, later, European audiences lusted and fantasized over her innocence turned lesbianism turned ardent worship of Astarte. But of them all, none more so than Pierre Louÿs who first invoked the muse in Algeria, summoning Bilitis, and in doing so causing one of the great scandals of literary history. For more than a decade after its publication in 1894, Louÿs was able to convince the world that his Les Chansons de Bilitis was a literal translation of an ancient Greek poet. When it proved to be untrue there was uproar by the public. This play is less about that uproar, or whatever deceptive intent the historical Louÿs had, and more about the creation of Bilitis and the agonizing process he engaged in to create her bucolics, elegies, and epigrams. More than a two thousand year pseudonym, Bilitis, is an attempt not to plagiarize an unknown writer in history but to establish one. The performance begins with a cacophony of voices from behind the audience’s seating, a projection on a screen before us stating the year (1921) and place (Paris). Pierre (Christopher Rivas) is on trial and upon the judge’s demands, is forced to answer for his crimes. The screen behind him then reverses the years to 1892 and brings us to a room where Pierre and Claude (Stephen Elrod) drink and lust over women, one especially, Meriem (Estela Garcia), a prostitute who Pierre has paid to spend the month with him. While they wait for her arrival, Pierre laments over his inability to create. “If only I could only publish something,” says the young and as of yet unknown poet. As if in response to his invocation Bilitis (Aryiel Hartman) then speaks to Pierre, bringing with her all the wonders of her ancient world. As Bilitis tries to penetrate Pierre, he attempts to do so in return in what amounts to a month of a tantric literary celebration. 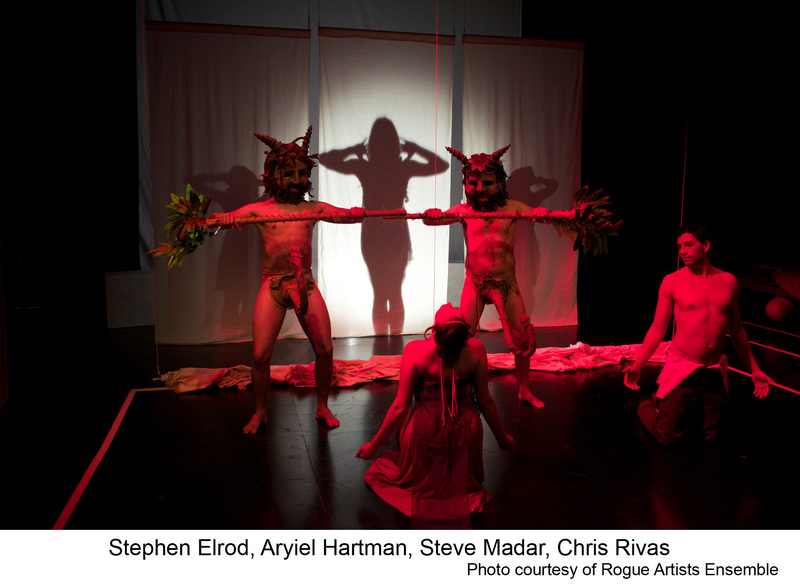 If Fellini’s Satyricon ever hit the stage it might resemble something like what the Rogue Artists Ensemble have brought to the Bootleg Theater. And the Bootleg is a good home for it, intimate enough for the audience to feel as though they are part of the production yet spacious enough to marvel at the ambitious technical staging directions. Rivas is as declarative and powerful as Hartman is seductive and tragic. When the worlds that are created behind the curtain force their ways to the foreground, however, all lines are blurred, all walls crushed, Hartman on the side of the ancients, Rivas for the Belle Époque. And though Pierre’s lust is at the core, this is not a production exclusive to human actors and desires. Every time a piece of furniture moves or a curtain rises it is done so with such precision that it feels as though the stage itself is a character. With an original run in 2012 at the Getty Villa in Malibu, Songs of Bilitis is adapted from Louÿs’ poems and the surrounding historical events by playwright Katie Polebaum and directed by Sean T. Cawelti. With creative puppet design by Cristina Bercovitz, inspired choreography by Nate Hodges, and a number of other technical directors and designers this Rogue Artists Ensemble production is a delightful spectacle and celebration. Songs of Bilitis is book-ended by the trial but is less about the outcome. Since there are no legal penalties suggested there are essentially no stakes in his future other than what he has already sacrificed. Pierre has chased Bilitis as did many a mythological suitor to their desire (Apollo after Daphne, Orpheus after Eurydice, Petrarch after Laura) and like the rest she led him back to the one all-important response: finish your work. A lesson many young working artists can perhaps benefit from. And though there are many that grasped for her, many who lusted for her, hers was an allure is too grand for one single poet to manage for all time. Hers is enough to seduce all who invoke it. If anything, it is his obedience to the muse that Pierre is on trial for and it we who must judge him. “Did you love her?” Pierre is asked. Songs of Bilitis is a spectacle and as one is worth seeing. Most likely it won’t change the way you feel about life, but while you are in the midst of it my guess is that you will be entertained, if not enamored. Songs of Bilitis plays at the Bootleg Theater (2220 Beverly Blvd) on Thursdays, Fridays, and Saturdays with an early curtain time of 7:30 pm. 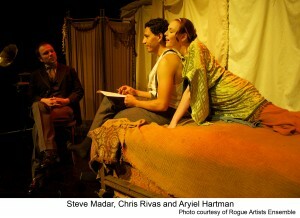 Originally staged at the Getty Villa in 2012, performances run from March 8-April 6.